Fifteen BA Business and Management (Retail) students recently benefited from direct commercial experience at Phase Eight, a highly successful British fashion retailer. Debbie Kemp, Lecturer in Retail, Innovation and Enterprise, led the corporate visit at Phase Eight’s Head Office in London. 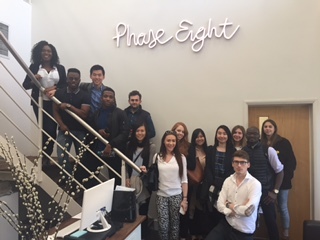 Student participants were fortunate to experience a tour of Phase Eight’s offices, design studios and fit rooms and heard presentations from the company’s designers, buyers, merchandisers and technical team. “We were delighted to visit one of the fastest growing fashion retailers in the UK. Phase Eight staff shared their company and industry experience which gave us a clear picture of the whole process of retail buying.